I remember when I was 11, mum used to take my sis and I to Bangsar food court because they had the yummiest claypot chicken rice. Seriously sizzling. Seriously yum. This is a popular chinese dish served commonly at hawker stalls around Malaysia. The original claypot chicken rice is cooked with chinese sausage and dried salted fish. The version I made did not have both of these, but it still tasted just as good. 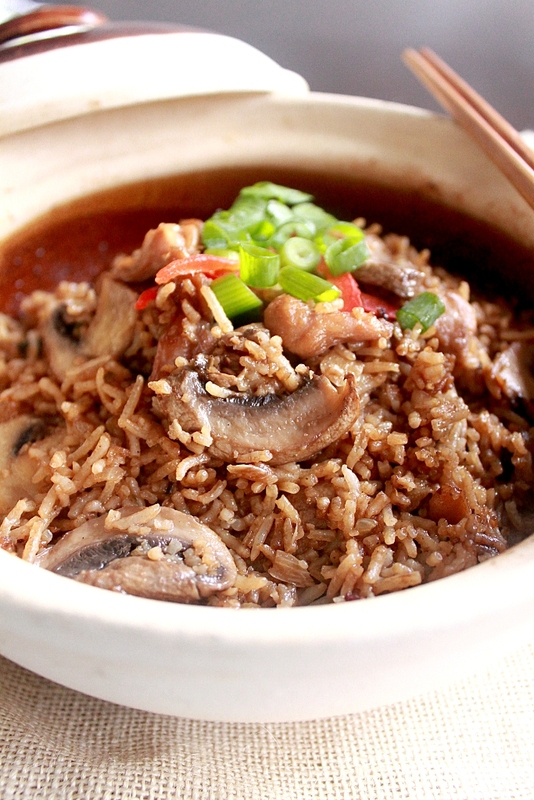 The secret about a good claypot chicken rice is getting the right amount of ginger and soy sauce. Of course the hero of this dish is the smokeyness that comes from cooking it in the claypot itself that you won’t get with any ordinary cooking pot. Claypot gives you that extra flavoursome crust you find at the bottom. Kinda like a paella crust. In which you leave the best for last. My sis and I used to fight for this. Get a spoon and just go crazy scooping and digging in. That for me my friends, completes my eating experience from this small humble claypot. So after all the fun comes the ugly part. Washing up. 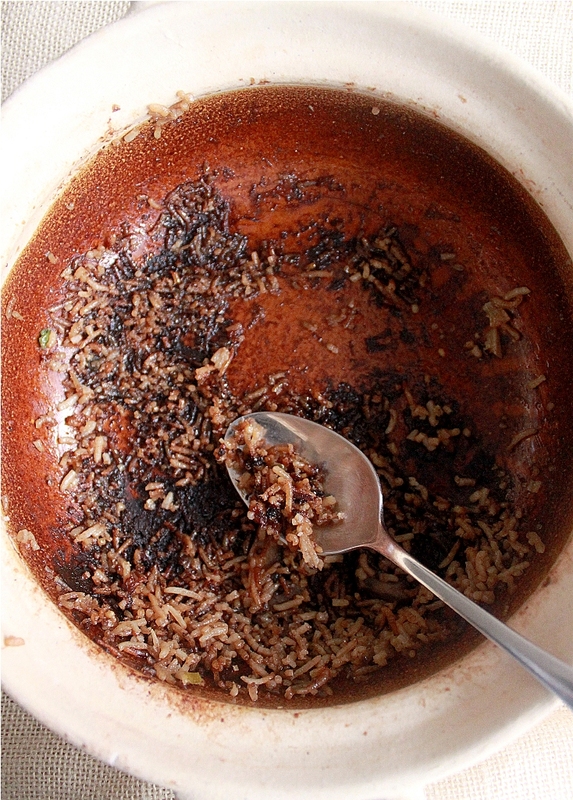 Who likes scrubbing out burnt rice? 1. Marinate the chicken and mushrooms together with all the sauces. 2. In a rice cooker, cook rice with water. Remove rice when cooked halfway. 3. In a claypot, heat up oil and sautee shallots, garlic and ginger until aromatic. 4. Add in chicken and mushroom pieces and cook for 7 minutes. 5. Add in chicken stock and half cooked rice to the mixture and combine well. Cover with claypot lid on a low – medium heat for 20 minutes. 7. Garnish with spring onions and serve immediately. Looks yummy. Bangsar is in KL right? I’m going there to see a dentist! Maybe I can eat some there! BTW can you get claypots anywhere here? Masya’allah…..I read with such intent of your chicken rice (ayam nasi) he..he that I was transported back to Bangsar! Yes, can chicken rice tastes delicious when cooked in a claypot. Iva Fariza, the contents of your website is chivalrously written. You;ve Got Talent! looks good. I bet the taste is as good.. I havent eaten nasi ayam claypot for quite sometime. Cant even remember when was the last. Hmm.. teragaklah pulak.. This. is. so. tantalizing! Claypot rice is one of my favourite Malaysian meals. Thank you for sharing the recipe. You make it look so easy. And I have to agree with your Mama’s comment. Wow this is so interesting, I have never cooked in a claypot before! (or eaten something cooked in a claypot?) I need to try it! 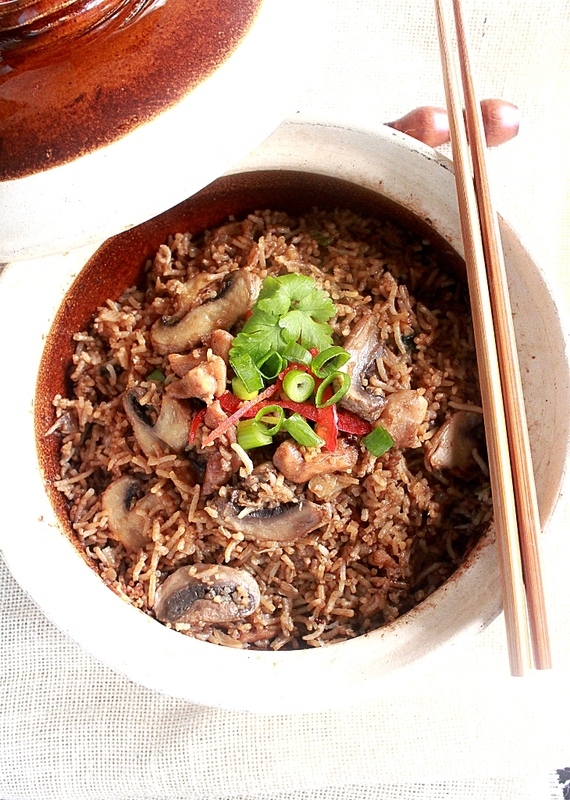 I love rice that’s cooked in a claypot, and the burnt rice is the best of this whole meal!! I will carefully scrape off and put it on top of the rice. The crunchy and burnt texture gives nice flavor… YUMMY! lol wow mama commented on your blog!